Ironically––as well as coincidentally––this week was full of westerns in a variety of forms. To boot, they were all very good as well. 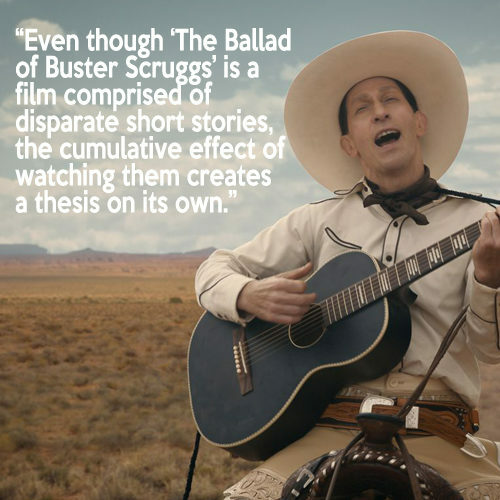 The Ballad of Buster Scruggs – A Netflix-original Western anthology film by the Coen Bros. The Coen Bros. are a legacy all their own by this point as their output has been steady and reliable since their 1984 debut with Blood Simple––a neo noir made with the swagger of competence far beyond what one could presume from their empty resumé. Though they have wandered throughout a panoply of film genres, those quirky noir roots have permeated every movie, whether obvious or not. Aside from crime films, they haven’t returned to a specific genre too often, though after 2007 they added another genre to their repertoire. No Country for Old Men––adapted from the novel by inimitable Cormac McCarthy––marked a toe into the pool of westerns, albeit a modern western, and it seems it was enough to keep bringing them back to the well; first in 2010 with their brilliant adaptation of True Grit and again, this year, with their inspired and very strange anthology film, The Ballad of Buster Scruggs. What is intriguing about Buster Scruggs is that it is the Coens’ first original entry into the genre. Even though it is a film comprised of disparate short stories, the cumulative effect of watching them creates a thesis on its own. 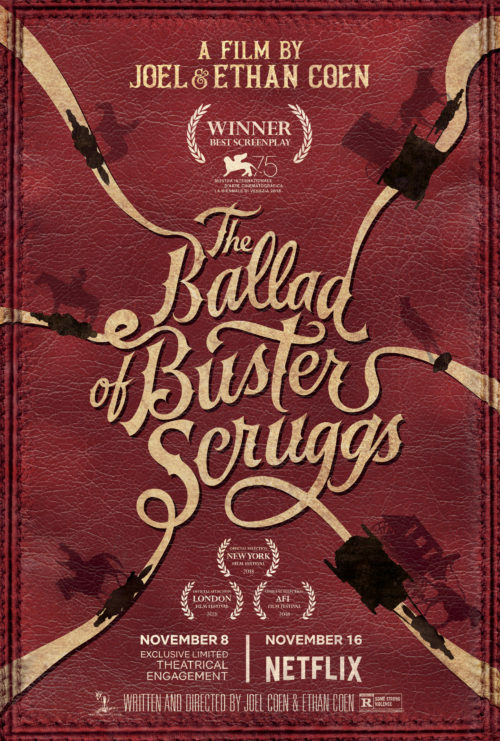 The stories range from absurdly silly to philosophically poetic, but when you step back to not only assess your judgement of the film but its place within the brothers’ oeuvre, the film takes on a metatextual quality: this movie is the Coen Bros.’ career in a nutshell, wrapped in a Wild West ribbon. 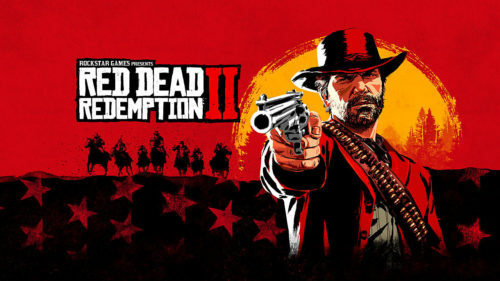 Despite being the worst-named game in the history of video games (RDR2 is actually a prequel to Red Dead Redemption, and is actually the third game in the series, with Red Dead Revolver being the first, albeit completely unconnected, narratively, to the two Redemption games), Red Dead Redemption 2 had a huge hurdle to clear. Red Dead Redemption was, culturally, a major landmark for video games when released in 2010. Red Dead Redemption created and offered a (at the time) living, breathing, changing world that seemed less a playground and more an actual setting you had to work and live within. That being said, on a recent conversation I had on my podcast, Rockstar––who is probably more well-known for creating the morally dubious Grand Theft Auto game series––knew how much cultural weight people were placing on to the sequel to what some have labeled “The Greatest Game of its Generation” and did what they wanted to do anyway. The previous game was loaded with powerfully cinematic and ludic moments where they made the player feel like they were playing something special and momentous and as powerful as any movie, novel, or tv show could ever be. So far, those moments don’t really exist in RDR2. However, it’s a very well-written game that is compelling in the face of its subtlety. 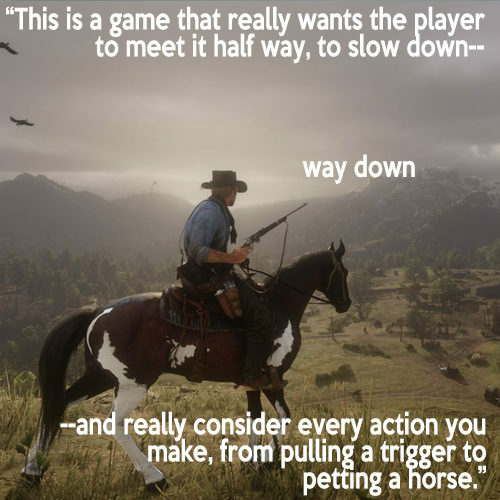 What it seems to be is a game that really wants the player to meet it half way, to slow down––way down––and really consider every action you make, from pulling a trigger to petting a horse. Once I adjusted my speed and learned the language of the game, I absolutely fell in love with the sandbox of zen that makes up Red Dead Redemption 2 and even though I can sit down for two hours and basically get nothing done in the game, I enjoy every second of it.